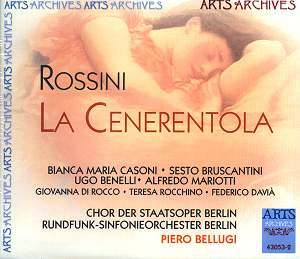 La Cenerentola, the composer�s twentieth opera, is Rossini�s most popular work after Il Barbiere di Siviglia. The libretto by Jacopo Ferretti is not based directly on Charles Perrault�s fairy tale of 1697 but was plagiarised from Pavesi�s Agatina o la virtu premiata, which had its premiere at La Scala in 1814. Originally Rossini was supposed to have set a different work. However, the ecclesiastical censors in Rome insisted on so many changes that the composer ditched his original plan and, with it, Ferretti�s libretto. With less than a month to go before the scheduled first night at the Teatro Valle, Rome on 25 January 1817, Rossini asked Ferretti to supply a new libretto. Both composer and librettist had to make compromises. Rossini borrowed the overture from his own farsa La gazzetta, written for Naples a mere five months earlier. He also employed a local musician, Luca Angolini, to assist him by composing all the secco recitatives as well as other pieces that are now omitted in performance and recordings, most of which follow Alberto Zedda�s Critical Edition. Zedda is the conductor on the Naxos issue (see review) and rather idiosyncratically includes one piece attributed to Angolini. That one piece does not account for the disparity in timing between this Arts issue and the Naxos that, like the Warner with Jennifer Larmore (see review), is timed at around 153:00 compared with the 116:00 here. This studio recording seems to follow the worst theatre performance practice prevalent in Italy at the time with massive cuts. These cuts are not noted in the booklet plot summary, which does not relate to the Italian libretto as printed. An track-related synopsis to what is actually being performed would have been of immense help. On the podium Pierro Bellugi conducts briskly but without conveying much sense of fun. The same can be said of the performances of Sesto Bruscantini as Dandini and Alfredo Mariotti as Don Magnifico. Their duet Un segreto d�importanza (CD 2 tr. 6) passes for nothing. Both are strong-voiced but do not seem to be able to spark life into this performance. Bianca Maria Casoni sings the eponymous role of Angiolina. She has a lean high mezzo lacking variety of colour that could inflect the required pathos into the role (CD 2 trs. 7 and 13). As in EMI�s 1969 La Forza del Destino, where she sings Preziosilla, the limitations of her instrument inhibit her portrayal. Ugo Benelli, one of the generation�s most sensitive tenore di grazia, who graced many recordings including Ramiro in an earlier version of Cenerentola from Decca, sings Angiolina�s prince. Nearing the end of his recording career he can and does manage to convey the essence of his role. The Alidoro of Federico Davia does not get his aria despite what it says in the booklet. The booklet advertises previous issues in this series including L�Italiana in Algeri and quotes the welcoming comments I made about it in my review. I gave an equally warm welcome to the performance of Armida, Rossini�s 22nd opera (see review). I regret I cannot give a similar welcome to this follow-up. On record La Cenerentola has had a charmed life. The Naxos at a similar low price to this Arts issue is better recorded, conducted and sung. It is also complete and better reflects the fun of Rossini�s outstanding opera buffa.